We reluctantly left our sunny spot near the Baekos Creek bridge and started the long and steady climb over several miles towards Red Pass, the beginning of a stretch that apparently holds the trickiest snow in this section. The trail initially climbs through dense forest but we still enjoyed dappled sunlight. We crossed several glacial streams as we gained elevation, and occasionally had glimpses of snow-covered peaks. We stopped at the White Chuck River bridge to enjoy the churning cascade of milky green water as it fell 8-10' over water-carved rocks. The sky was starting to fill with clouds, barely noticeable in the forest but as we broke out into a clearing below White Chuck Cinder Cone we discovered there wasn't a patch of blue remaining. We didn't yet have a view to the pass but the sky was darkening in that direction. We stopped on a grassy knoll for a late morning snack and map check, and were just about to leave when Grim + company came along. We joined up and made our way through the upper reaches of the basin to the large snowfields that covered the final approach to Red Pass. All were easily managed with poles alone. The view back down the basin was nothing short of spectacular, made even better with the rapidly building storm clouds and then a thick low mist that filled the valley as we continued to climb. We passed a grizzled marmot on a rock in the middle of one snowfield, then climbed the final switchbacks to Red Pass. We could see F-Stop starting up the snowfields, though he stopped to take pictures and didn't catch up to us. The views from Red Pass were another for the memory books, with endless ridge lines of snow-capped peaks and layer upon layer of storm clouds. The trail follows a rolling high traverse on a very steep slope between Red Pass & White Pass, and we were happily surprised to find it wet but generally clear of snow. The hillside was covered with a proliferation of wildflowers. We came across a few short but very steep and somewhat icy snow patches. Andrew & I used our ice axes and microspikes and were very comfortable. The others used just poles and made slow and tentative progress but all crossed safely. We dropped down to White Pass to find a large grassy spot perfect for a lunch break and enjoyed the company. Grim is soon to be a triple crowner, if he completes this PCT hike, and has great stories and sound advice. Andrew and I joked that the foursome is a bit like "Grim's thru-hiking master class." It's hailing, if you can't tell. Just south of White Pass. Lunch didn't last long, as the storm was moving fast and looked to be coming our way. Just as we packed our bags and grabbed our poles the first raindrops started to fall. Lightning, thunder, pounding rain, and hail soon followed. We expected this storm to pass quickly based on our experiences of the past 2 weeks but unfortunately this was not the case. We let the other 4 ahead of us on the trail as they generally hike faster and had a more aggressive mileage goal for the day, and within a few miles could no longer even see them in the distance. The rain continued all afternoon, with thunder and wind for a few hours before it settled in to a calm and misty but steady rain. By mid-afternoon we were drenched, and starting to get cold. Our goal for the day was Lake Sally Ann, and we couldn't have been happier to reach it around 5:30pm. Snow and snowmelt covered many of the best tent sites, but we found a well-drained and reasonably flat spot on a knoll that would do. We set up the tent in the rain, stripped our sopping clothes, and dove in. We cooked in the tent vestibule, and ate in the tent as the rain continued. It finally let up around 8:30pm, and we went outside to stretch our legs and re-organize our wet gear. We found that F-Stop and Liam had come in and set up tents, and there was a young couple from Seattle who had hiked in for the night (in jeans! ), all wet and cold. We commiserated briefly then headed for bed. The storm stayed distant on Day 14, perfect for staying dry but enjoying sky drama. This is taken from near the summit of Grizzly Peak. Day 14 started with rain on the tent but sunlight trying to break through the thick mist and clouds. We couldn't see the rock behind the lake, but far on the horizon the sky was a bit light. We lollygagged in the tent over breakfast, hoping the rain would let up and it worked. We stuffed all of the wet stuff from yesterday into the bottom of our packs, donned our least-wet clothes, and hit the trail around 7:30am for what was intended to be a 20+ mile day. The miles went by quickly as the trail covers relatively gentle terrain over forested slopes with minimal blowdown. The mist cleared and by late morning we actually had patches of sun between the clouds. We stopped at a pass to wring out our socks, and decided to try hanging the wet clothes on our packs to take advantage of at least a few hours of sunlight. Each time we stopped we would remove a layer worn, and change into another article of damp clothing, and by the mid-afternoon nearly everything was dry. Well, Washington-dry, at least, and that was good enough for us. We reached our "B-goal" of Lake Janus just after 5pm, 20 miles into the day. It wasn't particularly scenic, had plenty of mosquitos, and would keep us 4 miles further from our resupply tomorrow morning, so we decided to push on. We had a relatively long break there to make water, take off shoes, and have a snack, but then continued on for the climb up to our "A-goal" of Lake Valhalla. Lake Valhalla means our 24 miles are complete. Our energy was definitely waning, but the evening was cool and perfect for hiking and the climb was fortunately rather civilized. We passed NOBO thru-hiker Legend about a mile before our campsite, and learned that his start date was May 3 (!!!!!). We wished each other luck and continued on, buoyed a bit by the interaction. Lake Valhalla is a stunner, sitting on a ledge below a dominant rock outcropping. The campsites along the trail are not at the lake itself, but near its inlet. There was already a tent set up but from the trappings it looked like other thru-hikers so we didn't hesitate to plop down right next to them. They called out hello from inside and we learned they are "completers", back to finish the last section of their 2013 thru-hike that was cut short by a blizzard just north of Stevens Pass. We dined like Argentinians (late, by thru-hiker standards) and passed out in our sleeping bags. Day 15 dawned clear and crisp. We met our neighbors, Sharkey & Beverly from near Sonora CA over coffee/tea and morning camp chores, then they headed north and we hit the trail for the last handful of miles into Stevens Pass, where Andrew's brother, sister-in-law, and mum would meet us with our resupply. The miles flew by as they were generally downhill through easy forest trail. The final mile seemed endless, as it was a steady but gradual uphill. We could see and hear the highway but felt we may never reach it as we pushed through shoulder-high wet grasses and brambles. Finally we reached the green-roofed A-frame building that marks the PCT trailhead. We saw Beanstalk and Dustin hitchhiking on Hwy 2 - they hadn't made it out last night after all. They camped closer than we did, and only arrived here ~45 minutes ago. Jaimie had flagged down a car right away (girls always make the best hitchhikers), so she & Grim were already off to Skykomish for a town day. We had a quick chat and said we'd see them down the trail. Andrew's family not only brought our re-supply, but came bearing sandwiches and fresh fruit! More blueberries, oranges, cherries, and apples than we could even eat. Andrew's mum made friends with each hiker coming off of the trail, and shared the abundance of treats to everybody's great delight. Trail magic in action. We hung out with them for a bit, then caught up on real-world stuff online for a bit longer before heading south. Next town stop = Snoqualmie Pass, where we'll spend the night and have showers and laundry. First, it's into the Alpine Lakes Wilderness for us. 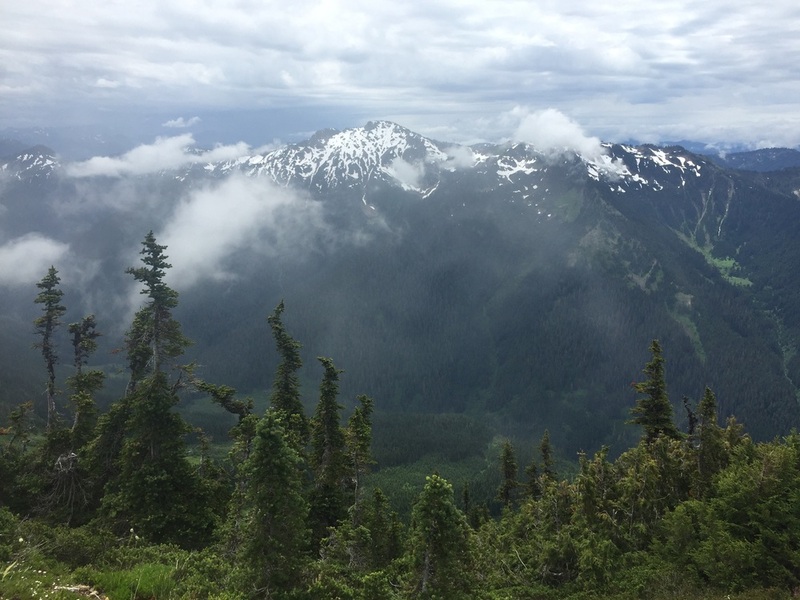 The section we just completed, from Rainy Pass to Stevens Pass, is 127 trail miles long with ~31,000' elevation gain and a similar amount of loss. We've hiked just over 220 miles so far.